Description Unbeatable style comfort and convenience come together at the new Fairfield Inn and Suites Atlanta Lithia Springs located 15 miles west of the Hartsfield-Jackson International Airport and one exit from Six Flags Over Georgia. Our location offers easy access to various attractions in downtown Atlanta including the new Mercedes-Benz Stadium. Our hotel has everything you need to keep you going. Stay productive with flexible workspaces and free Wi-Fi throughout the hotel. Stay balanced with our hot complimentary breakfast and healthy snacks in the 24 hour market. Rest well with a great nights sleep in any of our various room types which have been specially designed to help you relax and work in comfort while never skipping a beat. In your downtime stay fit in our state-of-the-art fitness center to maintain your workout routine. Then take a refreshing swim in our outdoor lap pool. Whether for work or play experience a comfortable stay at the new Fairfield Inn & Suites Atlanta Lithia Springs. 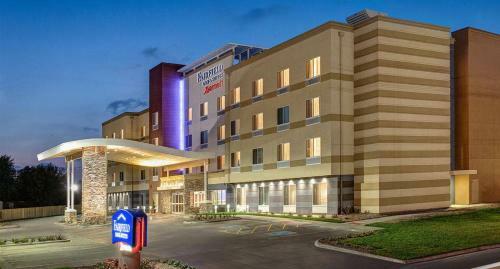 Add Fairfield Inn & Suites By Marriott Atlanta Lithia Springs to your free online travel itinerary.